If you are reading this article I assume you have been told of the many advantages of a waterbed. The first thing you will need to decide is whether you would like a hard sided waterbed or a soft sided waterbed. Hardside Waterbeds. When waterbeds became popular many years ago all waterbeds had a hard frame. As the name suggests there is a solid frame that contains the waterbed mattress. Customers that have owned waterbeds for many years will tell friends and relatives that their waterbed is the best bed in the world (myself included) They will also mention that one drawback is that the hard side can make it difficult to get in and out of the bed. Unlike a conventional mattress, if you sit on the water bed mattress near the edge, you will sink right down because all your weight is directly down. This in turn means that your knees are up in the air, so not really practical for sitting on the edge. You will soon develop a technique for sort of rolling out. Our upholstered range of hardsided waterbed frames soften the hard edge. A small consideration is that the frame also adds to the overall dimension of the bed, so take that into account when calculating what size bed to buy. Fitting a waterbed mattress protector and fitted sheets is also a bit of a chore in comparison to a softsided waterbed. Despite these disadvantages generally the frame is upholstered or built of solid pine which can have a very nice appearance. The full range can be seen by clicking the image. A softsided waterbed on the other hand has the appearance of a conventional divan bed. This makes it very versatile, select the headboard that suits your decor, choose the colour and matching base. Getting in and out is very easy because the top cover is zipped across the whole bed as opposed to just around the mattress. Because the bed has the appearance of a conventional divan bed it will also take standard sized fitted sheets. 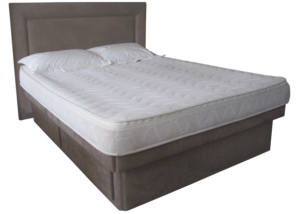 Early and cheap quality waterbeds have a fundamental design fault which means that over a short space of time the side foams will begin to bulge out as a result of the water pressure and anyone sitting on the edge. Our Olympia Deluxe is specifically designed to deal with this issue keeping its shape for years and years as opposed to months. 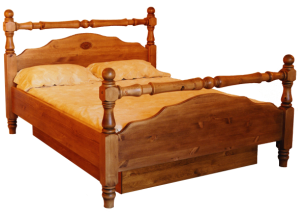 Having decided which type of water bed will best suit your needs you can then choose the size of the bed you require. You can choose the stability from a range of five waterbed mattresses and the more specialised option of dual waterbed mattresses. Watch our video for guidance and advice or visit our shop in Southsea. Softside waterbeds are very versatile. Adding your choice of headboard will customise the appearance of your bed to suit your decor. We have a great range of headboards to choose from. A drawer unit will provide valuable storage in the base. You may decide to add a spare washable cover and sheets but your waterbed will be supplied with everything you need including the water bed mattress, safety liner, waterbed heater, mattress protector and waterbed conditioner. All that remains to decide is whether you want one of our technicians to deliver and install the bed for you or if you wish to install the waterbed yourself. We have easy to follow installation guides to help. If you would like to discuss your requirements simply call or email and we will be pleased to help.